How to protect your private information in the wake of the Equifax hack has been a popular topic. Advocates recommend you monitor your loan and credit card accounts, change your passwords and importantly, check your credit reports. But there are different kinds of credit reports out there, not just the big three — Equifax, Experian and TransUnion — that you’re commonly told about. There are the kinds of reports run by employers, which often include criminal background checks. Landlords run a different kind of report,and these may cover the typical credit issues but also show a history of evictions, lawsuits and other items. You even have an insurance credit score, which is supposed to predict how likely it is a consumer will file a claim. But did you know you also have a banking credit report? If you’ve ever had a bank account in your name, you probably have one. The largest company that does these kinds of reports is ChexSystems, which is used by some 80 percent of banks, according to public reports. Other reporting companies include TeleCheck, Early Warning Systems and there are more. They have other information, too. For example, ChexSystems has a “wealth index,” ranking you from 0, which is “no information on file,” to 6, which is “very high evidence of wealth.” These rankings are based on public information about any watercraft, aircraft and other property you may own, ChexSystems said on its site. 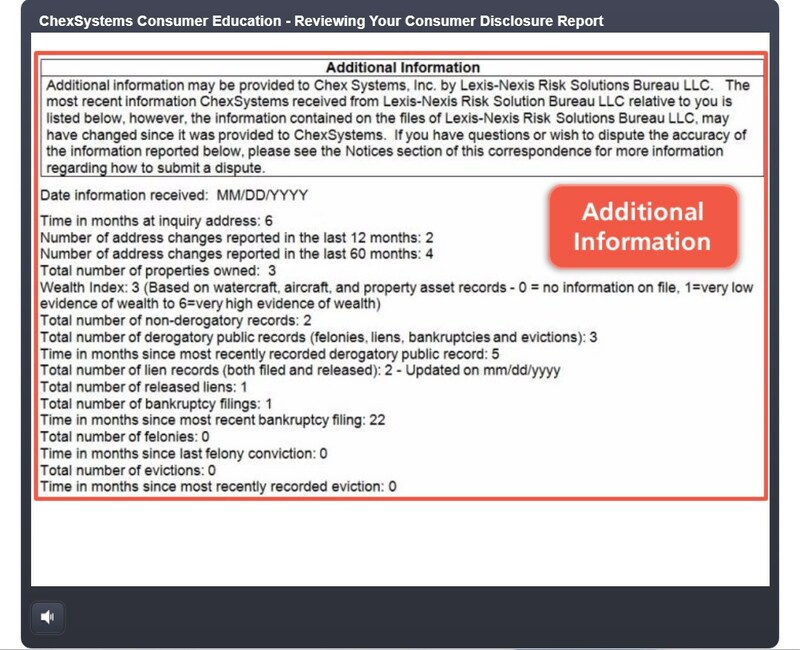 A screen shot from ChexSystems, showing a sample of the kind of data that could be included in a consumer’s report. See this video to understand what you might find in a ChexSystems report. They’re not supposed to have any impact on your credit score or a lender’s decision to approve you for a loan or other credit. Instead, banks will use these reports to see if you ever “abused” an account. To see if you’re a good customer. That’s a pretty good reason to make sure your report is accurate, but you have an even better reason to check these reports: to make sure no one is using your personal information for nefarious purposes. A scammer could open an account in your name. Perhaps the con artist writes checks in your name — checks that are sure to bounce. Or they open a credit card along with the checking account, and start shopping, hoping to leave you with the bill. Even if you’re not the victim of this kind of fraud, there are other reasons to see what bank accounts show up in these reports. Remember the Wells Fargo scandal, when the company discovered some 3.5 million fake bank and credit card accounts? Employees opened the unauthorized accounts in the names of unwitting customers because of the company’s sales culture and in an attempt to reach certain sales goals, reports said. But had consumers reviewed their ChexSystems reports, they could have learned about the unauthorized accounts long before the scandal broke. If you never banked with Wells Fargo and you’re pretty sure no one has opened an account in your name or violated your good credit, there are other reasons to check your report. That’s because it’s not just fake accounts you should watch for. You should also look for forgotten ones. Sometimes we have old accounts that we never closed, for example, when we moved or changed banks. Or maybe, we thought an old account actually was closed but something got lost along the way and it never was. These “zombie” accounts — accounts that never seem to die — can cost you a lot of money, said Ken Tumin of DepositAccounts.com. If the checking account has any negative balance, you’ll be on the hook for the money, he said. The negative balance could result in a stain on your ChexSystems report, which in turn could prevent you from opening new accounts at other banks and credit unions. The stain could spread if the bank turns over the negative balance information to a collection agency, and that would hurt your credit score. To protect yourself, get a copy of your report from ChexSystems or a similar service. Just like your big three reports, you can get a free copy once a year. You can dispute items on these reports just as you can with the big three. Just visit the reporting company’s website and follow the directions. During our research for this column, we requested our own report online from ChexSystems. It’s supposed to arrive via snail mail in five business days. We’ll let you know if we see anything fishy.